Often common locally in deciduous or mixed forests, wherever there is oak, including beech-maple, oak-hickory, or northern hardwoods stands, and even sometimes in rather swampy sites; occasionally no oak is evident in the immediate vicinity. 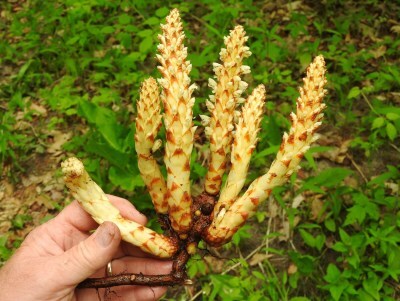 The dense inflorescence, which some have likened to a pine cone in gross appearance, usually occupies half or more the height of the plant, which overall is somewhat cream-colored to yellowish brown when fresh, except for brown tips on the bracts and leaves. The only known host is oak (Quercus spp., especially Q. rubra in Michigan). A large woody gall is formed where the parasite’s root is attached to the oak root. After about 4 years of underground growth, Conopholis sends up thick annual flowering stems for several more years. MICHIGAN FLORA ONLINE. A. A. Reznicek, E. G. Voss, & B. S. Walters. February 2011. University of Michigan. Web. April 25, 2019. https://michiganflora.net/species.aspx?id=1860.